Easter is right around the corner, which means it’s time to make some fun Easter-themed treats! 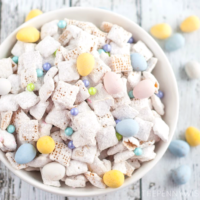 This Easter Bunny Chow is so yummy and the pastel colors make it a pretty treat for all of your Easter and spring celebrations. As a busy mom, I’m all about making quick and easy treats and that is why I love making Puppy Chow/Muddy Buddies. It only takes about 15 minutes to make and you can customize it for any holiday. 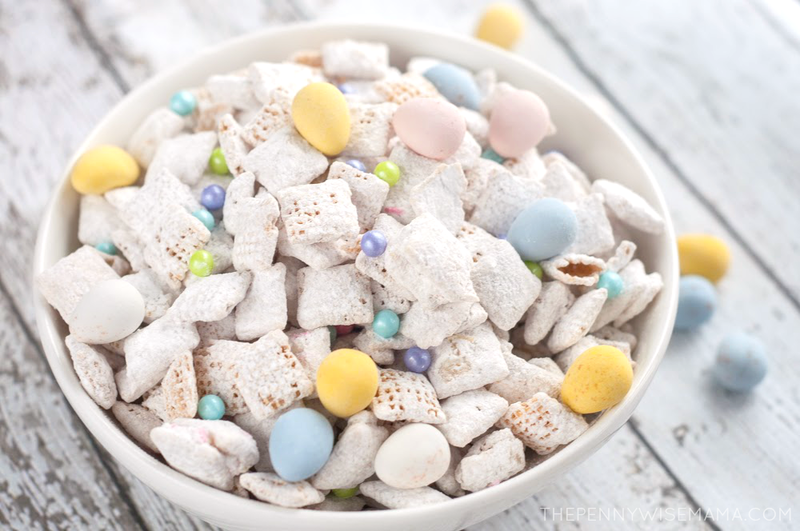 My Reindeer Chow is always a huge hit over the holidays, so I thought it would be fun to make it with pastel colors for Easter. 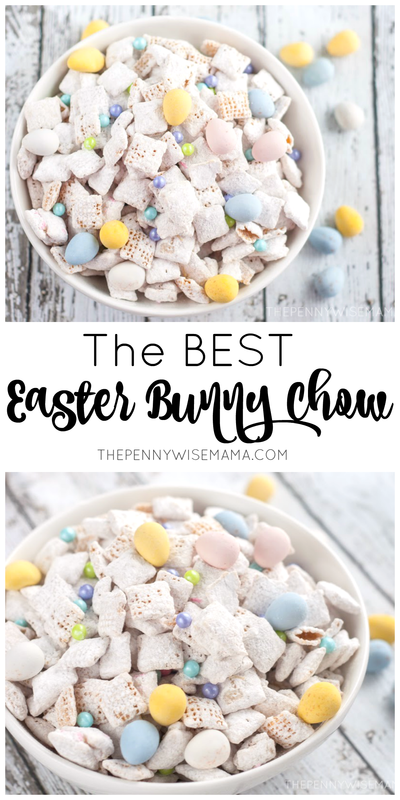 This recipe is very similar to the original Chex Muddy Buddies recipe, however, instead of using semisweet chocolate chips, you use white chocolate chips and you don’t use any peanut butter or butter. 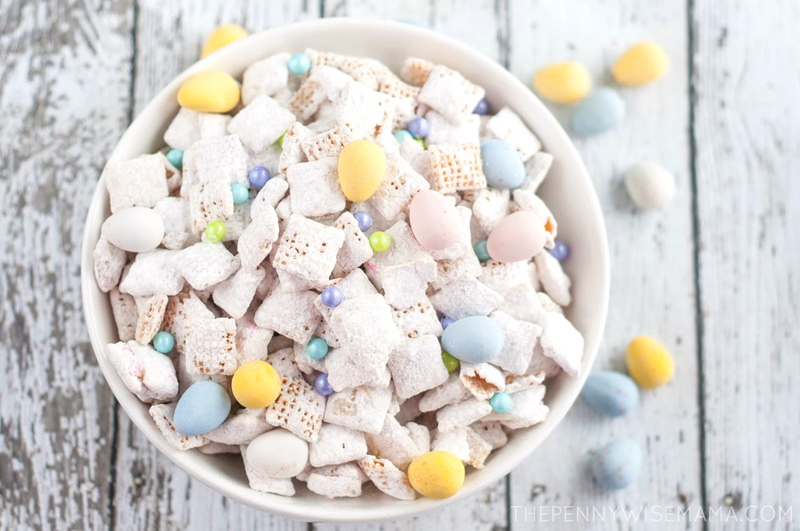 To make it perfect for Easter and/or spring, you’ll also want to add in some Cadbury Mini Eggs and pastel nonpareils or sprinkles! This recipe is a family favorite and it also makes a great homemade gift for a teacher or friend. Simply pour a couple of cups in a cellophane gift bag or mason jar and tie it with a pretty ribbon. So fun and easy! 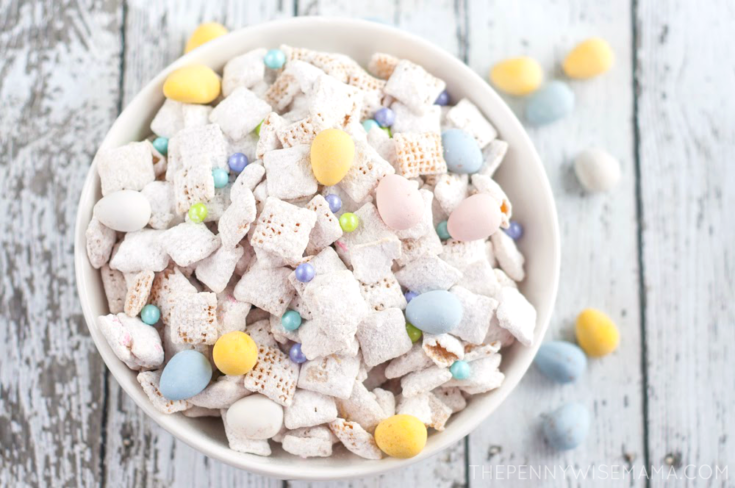 This Easter Bunny Chow is so yummy and the pastel colors make it a pretty treat for all of your Easter and spring celebrations. Put powdered sugar and decorative pastel sprinkles in a large ziploc bag; set aside. Melt chips in a microwave safe bowl at 30 second increments until smooth. Pour white chocolate over cereal, stir gently to coat. Add cereal to bag with powdered sugar, seal and gently shake to coat. 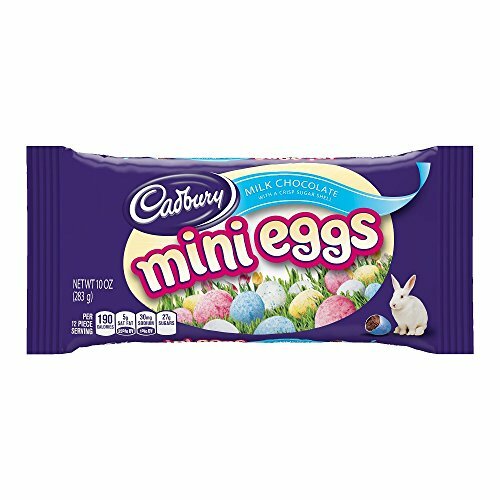 Add mini eggs, then serve. What a yummy idea. I love all of the pastels in this and also the little pearl candies. Definitely need to try this! What a fun treat for spring. I love the pastel colors. This looks great, I’m certainly gonna give it a try. This does look so good, and we love white chocolate. I’d love to try this! I am a huge fan of white chocolate and I make a recipe similar to this around Christmas time. I would love to try this! This looks so yummy and fun to make! I love the pastel colors! What a delicious, festive treat that my grandsons would enjoy! That looks so good! Thank you! this looks so fun and festive! i know the girls would love to make it . I love these ‘puppy chow’ type recipes. I love throwing these together at holidays but I haven’t tried an Easter one yet. I like the idea of re-branding it bunny chow, lol. This just screams Spring and looks so good! Thanks for the idea! So colorful for Spring! I bet it’s delicious too! This looks so yummy and I know my children would really enjoy helping me make it! I would love to make this with my nieces! I can not wait to try this! So cute, colorful and looks so yummy! This will be a wonderful addition to our Easter treats. Perfect for snacking on for our back yard bar b q get together. Looks delicious! This sounds so good. I have seen the original version before but I haven’t seen this Easter version with the white chocolate and it sounds so so good. Gosh there is a version of puppy chow for every holiday, huh?! I love it though! I’ve never tried a white chocolate version, but would like to as I really like it. Love the pastel colors! So pretty!